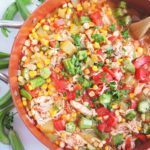 This Okra, Corn, & Tomato Chicken Stew is a comforting, family recipe that would be sure to warm your heart! 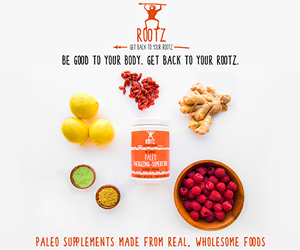 It’s made with wholesome ingredients that add so much flavor….you’ll forget it’s less than 200 calories per serving! Can you believe that it’s already February?? I have a feeling that this year is going to go by super fast…kinda like it did last year! I’m not stressing over it because February happens to be one of my favorite months! During the month of February, we get to celebrate Valentine’s Day and Black History Month! And I’m proud to announce that the Black History Month Potluck is back again this year! 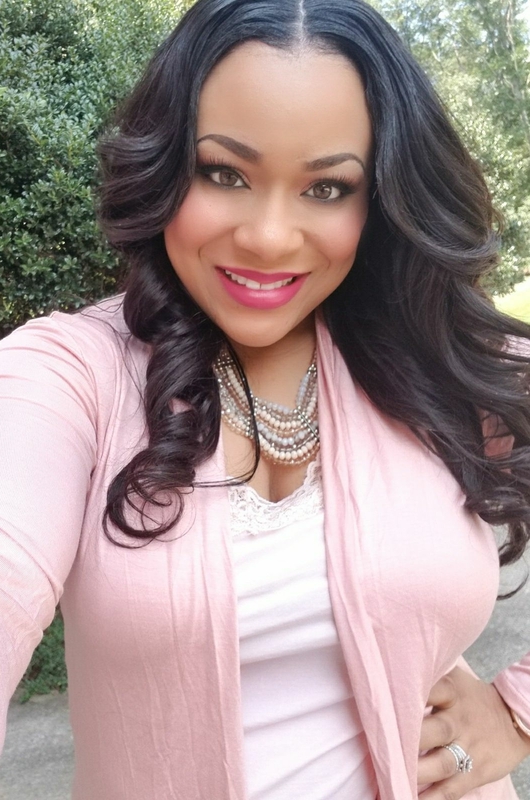 I’ve teamed up with some of the BEST foodies in the Black Bloggers Food Group to bring you some AMAZING recipes! There’s literally something for everyone to enjoy! Don’t worry, I will share that list with you a little bit later! ? 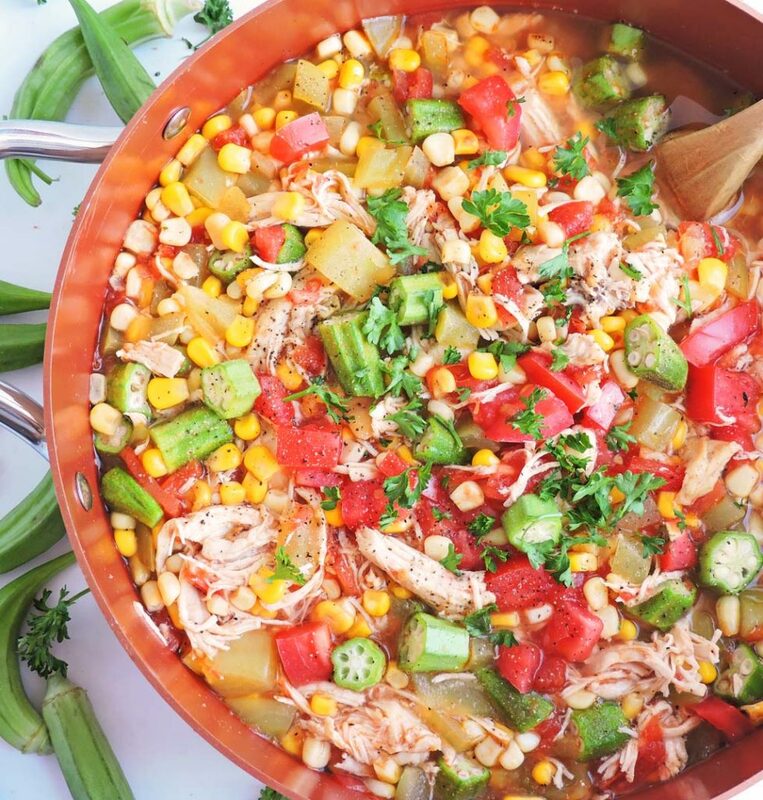 My contribution to our BHM Potluck was this delicious Okra, Corn, & Tomato Chicken Stew! This recipe brings back memories of my childhood. My mom would make okra, corn, and tomato soup after getting some fresh produce from the farmer’s market. If you loved this recipe, you’ll love these! I absolutely LOVED that soup! My mom got this recipe from her mom, so it’s become a family favorite and tradition. Even though the soup is absolutely perfect the way my mom made it, I wanted to add my unique spin on it and turn it into a fulfilling stew! I decided to add chicken to my mom’s original recipe, and I also added a few green tomatoes to give it a little tart taste. 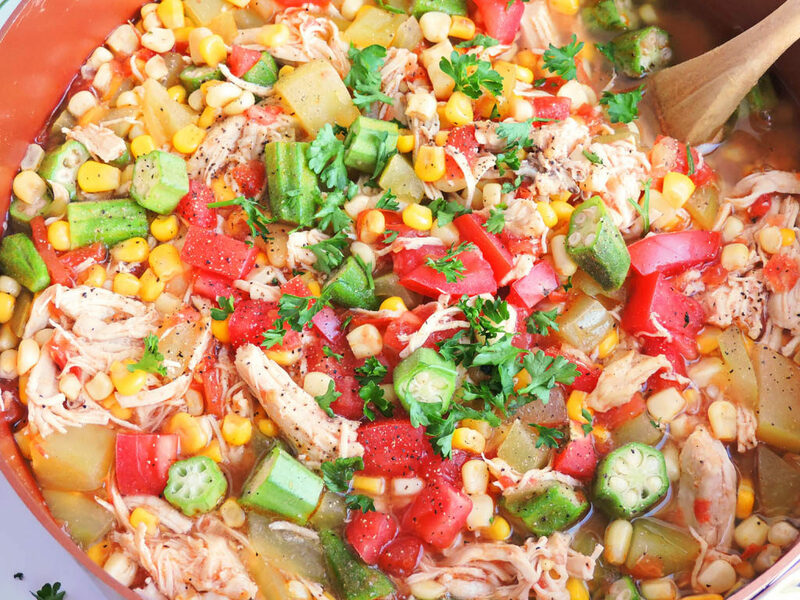 I cooked it in my slow cooker and allowed those flavors to really come together. 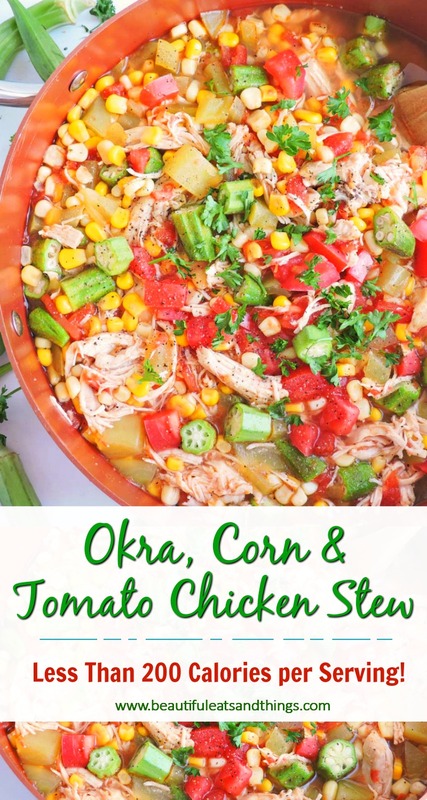 When making this Okra, Corn, and Tomato Chicken Stew, I recommend adding the okra towards the very end of the cooking process. This prevents the soup from becoming too slimy! I’m not a fan of slimy soup! 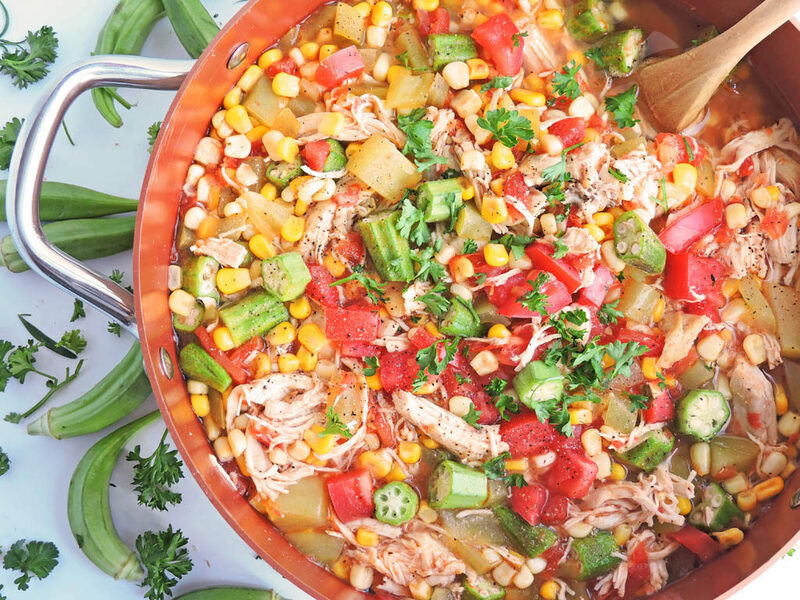 This Okra, Corn, and Tomato Chicken Stew is so hearty and flavorful, that it’s hard to believe it’s on the lighter side! 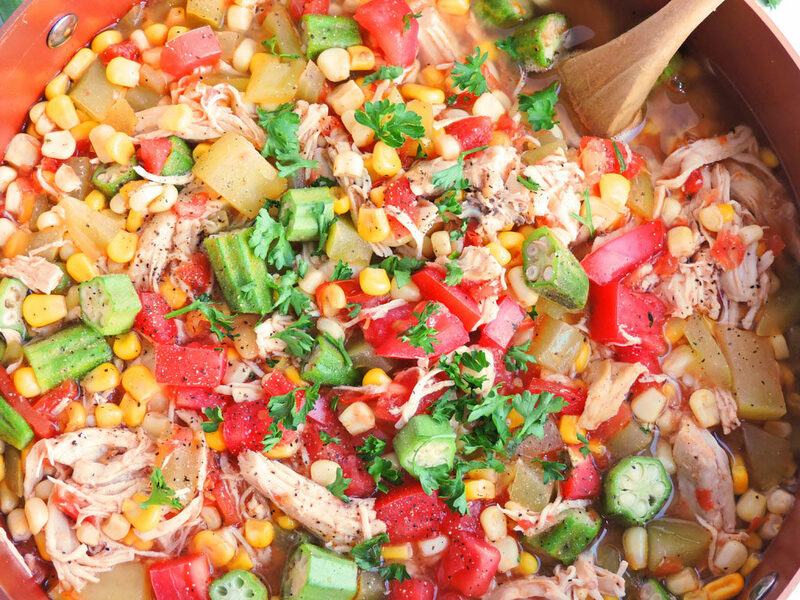 This stew is less than 200 calories per serving and very low in fat! 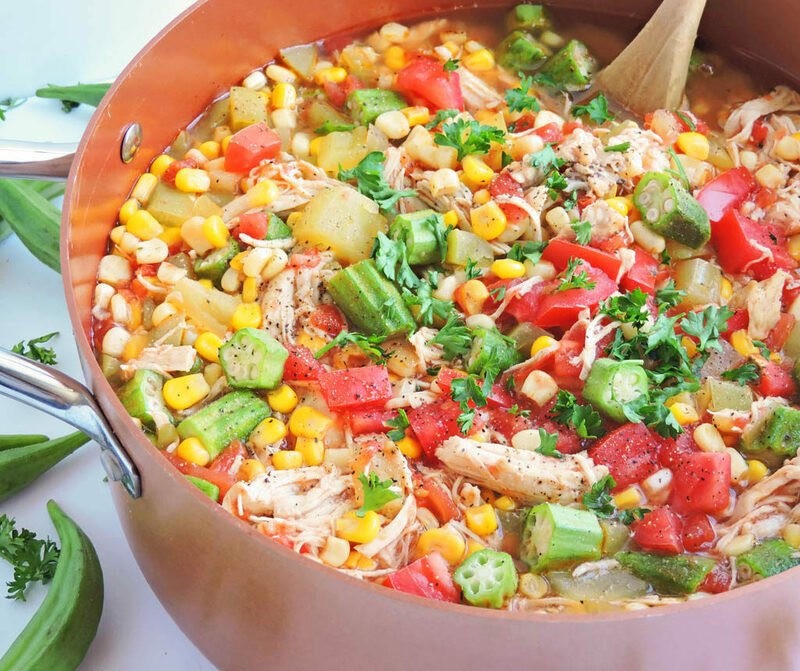 It’s the perfect recipe for those chilly nights! 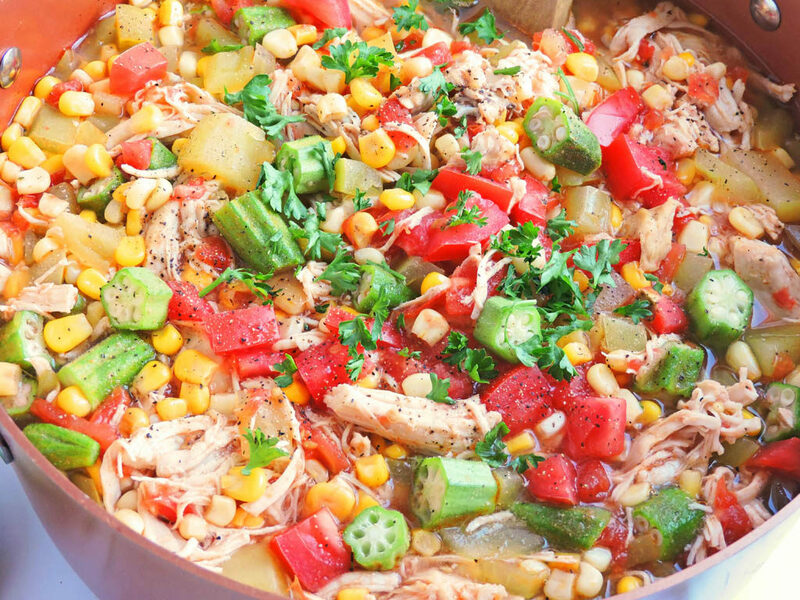 Add red tomatoes, green tomatoes, frozen corn, and, chicken breast to slow cooker. Add 3 cups of water and cover. Cook on high for 4 about hours. After about 4 hours, shred chicken and add okra, reduce setting to low and cook for another 1.5-2 hrs or until okra is tender. And as promised…Welcome to our BHM Potluck!!! These recipes are seriously drool-worthy! I can’t wait to make them all! Which recipe are you going to try first?? Let me know in the comments below!